Paul and Sarah met while working as Chefs at Biltmore Estate in Asheville, NC. When the time came to purchase a home and start a family, they immediately settled on Hendersonville. Five years later and with the addition of their one year old son Hayden, Paul and Sarah are excited to take their commitment to this community to a new level. Having worked in upscale establishments for much of their careers, Sarah and Paul wanted their first restaurant project to be fun and approachable. HenDough aims to accomplish that while maintaining the high level of quality and hospitality that they have come to expect. 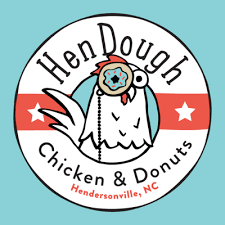 Realizing that bringing HenDough to life wouldn’t be possible without the support of the community, Paul and Sarah hope to give back through the support of local businesses and farms.